Whether jumping into a new field entirely, or adding another string to your bow, postgraduate opportunities in creative industries are ideal for those looking to indulge their creative streak. Victoria F., a graduate in MA Producing at MetFilm School, outlines her experience of stepping into the world of film, and some of the major considerations for those also thinking of taking the plunge. My first degree was in naval engineering. My family ran a shipping business, and before I knew it I was off to the University of Southampton to study for an engineering degree and eventually a masters, before returning to the family business with a solid set of qualifications under my belt. I had, over the years in the company, built up business experience, management experience and commercial acumen, but there was something gnawing away inside at me. My long-standing passion for film. I had day-dreamed about working in the industry, but never knew quite how, or when, to make the move. Then circumstances changed, I decided to come to London - the European capital of the film industry and look into a masters course to study while I was still working. My original degree was quite academic, so I was ideally looking for something hands-on, but didn’t want to abandon everything I had done in with my career so far. In my chosen field of film there are lots of different disciplines and types of course available so I spent some time looking at prospectuses to figure out what would best suit me. Producing is an area of the industry which combines the creativity of filmmaking with the more business aspect of the industry – negotiating commercial rights, sealing distribution deals – a balance I found attractive because it allowed me to draw on my previous business experience. It sounded perfect for me, and this bore true in reality too. One of the best things about studying at masters level, compared to undergrad, is that everybody on the course is really strongly invested in what they are doing, either through significant passion and commitment to the subject or drive and determination to get a great job at the end of it. Masters courses in creative industries – traditionally a very flexible sector – may have quite a broad intake, so while being an entrant into an entirely new discipline might be intimidating on paper, in reality it doesn’t make that much of a difference once you’re there. That said, there will be lots of ground to cover – from familiarising yourself with new terminology or software, to gaining new specialist skills. Identifying areas that you could work on before the start of the course might help you to get up to speed. Though it’s important to remember that any potential skills gaps may also be offset against strengths in other areas; for example my business experience meant I had absolutely no trouble with tasks that involved giving presentations or managing complex projects, which I had done previously, but other students had not. 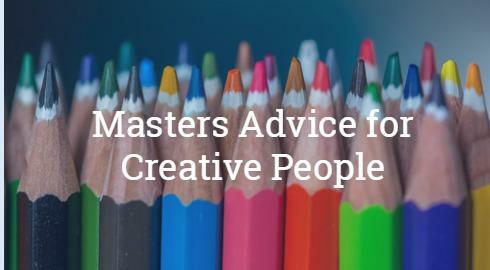 People transition in and out of the creative industries from a wide range of different professional backgrounds, and this means that people’s networks are generally broad and diverse. Masters courses are therefore a brilliant way of establishing yourself in your new field – the people that you make friends with on your course may well turn out to be your future business partners or collaborators, or at least give you access to lots of people who might employ you in the future. Since starting my masters I haven’t looked back – while there have definitely been times that I’ve wondered how I would learn all of this new stuff, I firmly believe that with passion, drive, determination, and people around you, nothing can hold you back! My advice for anyone considering a masters in a new field is simply to go for it, you won’t regret it for a second.